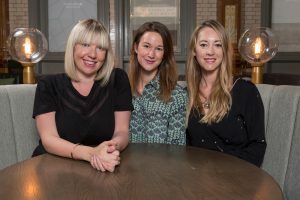 The Refuge by Volta, Manchester's new city centre restaurant and part of a multi-million pound revamp of The Palace Hotel, has appointed a new PR and marketing team. Gemma Gore, director at We Are Indigo, Siobhan Hanley of Siobhan Hanley Communications and marketing and events consultant, Faye Millar, have joined forces to launch the high-profile venue next month. Gore and Hanley will handle the PR and media communications, with Millar managing marketing, events and new business development. Simon Willis, brand director for Project 1898, and Luke Cowdrey and Justin Crawford, the curators of ‘The Refuge by Volta’, have put the team together. Willis said: “We wanted to make sure that we have a team in place who share our passion and energy, and who can help launch The Refuge by Volta with a bang and help us quickly make a mark on Manchester’s restaurant and bar scene.